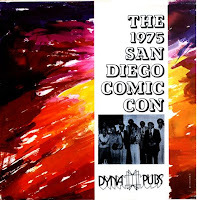 Kleefeld on Comics: 1975 San Diego Comic Con: The Album! I came across a new site (launched Dec. 10 in the wake of Shel Dorf's and Ken Krueger's passings) entitled Comic Convention Memories, which will be used to as "a page for everyone who’s worked on a con or been a guest or dealer at one, for anyone who has a good story to tell, as long as someone is willing to contribute the words and pictures." One of the first posts is are MP3s of a record album Alan Light made from the 1975 San Diego Comic Con. Be sure to subscribe to the site when you're done listening, too! I'm sure there's going to be some really great stuff there!